CLARIFICATION: Just so it’s clear, this question is specifically about the economic claims made by the meme presented below. It is a NOT question concerning the origins and etymology of the word “shot” in any way/shape/form. If there is a desire to discuss/debate the etymology of the word “shot” I have started a thread at the English Language SE site specifically for that purpose. In the old west a .45 cartridge for a six-gun cost 12 cents, so did a glass of whiskey. If a cowhand was low on cash he would often give the bartender a cartridge in exchange for a drink. This became known as a “shot” of whiskey. That little bit of trivia seems a bit too perfect: Guns, booze and the cost of one thing connected to one thing is the same as another thing. Perhaps this is a “legend” that spawned from people trading physical objects instead of using cash at local stores and then was distilled (figuratively) into this one sentence over time? The answer seems to be no on all accounts. Although the meme is of recent origin, Internet mentions of this alleged historical fact date to at least 2003. Significantly, however, we were unable to trace it back any further than that, nor could we find any credible support for the general claim that it was common to use ammunition as a substitute for hard currency in frontier drinking establishments. The 1891 edition of Chicago hardware dealer Hibbard, Spencer, Bartlett & Co.’s General Catalog lists Smith & Wesson .45 cartridges at a price of $25 per thousand, or 2-1/2 cents per cartridge. For the price of a shot of whiskey, we consulted Kelly J. Dixon’s 2005 book Boomtown Saloons: Archaeology and History in Virginia City, which notes that the average cost of a measure of any drink was around two bits, or 25 cents (although the cost later dropped as competition increased when more Americans moved west). Using those figures as our base prices, one shot of whiskey would have cost the equivalent of 10 cartridges. 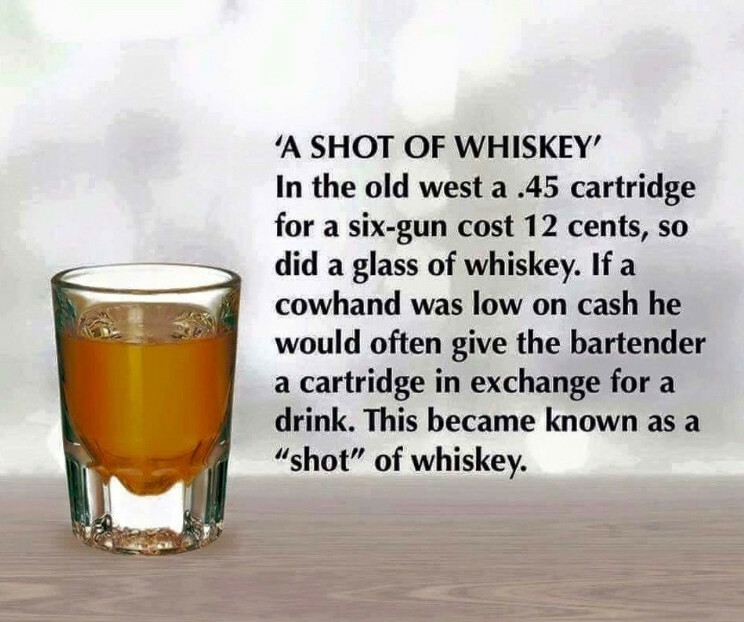 Even allowing for price variations according to time and place, it appears highly doubtful a one-to-one correspondence between the price of a cartridge and the cost of a drink ever existed in the Old West. A company of fellows would needs drink 2d a peece..their vain way of drinking shots. The word "Shot", a corruption of the Late Old-Engish "Scot" or "Secot", itself a corruption of the old Norse "skot", was a word meaning a Tax or measure. This means it pre-dates not just the "Wild West" period of American history, but also the invention of the first firearms. A cannon used to fire either a large Cannonball or a measure ("shot") of smaller pellets/projectiles for a wider spread. Someone hit with these smaller pellets had been "hit by shot", or just "shot" - so, it seems likely that the etymology is actually the opposite of that "trivia". Not the answer you're looking for? Browse other questions tagged history economics guns alcohol . Were the works of Greek and Roman thinkers available to the West during the Middle Ages?